The Giurgiulesti International Free Port in Moldova sits along a small stretch of the Danube River. Until recently, Moldova relied on Romania and Ukraine for access to foreign goods and trade. GIURGIULESTI, Moldova — Like many rural villages throughout Europe, Giurgiulesti was shrinking. The young had left, seeking work and better futures, and they never came back. The old had stayed behind, tilling the fields and nurturing the grapes on backyard vines that they used to make wine. But in 1999, partly in exchange for ceding a stretch of contested road in the east of the country to Ukraine, Moldovawas given a 1,476-foot strip along the Danube that had been in Ukrainian hands since the fall of the Soviet Union. From the strip, the borders with both Romania and Ukraine can be seen. In 2007, after years of faltering progress, the oil terminal at Giurgiulesti’s port became active, and in 2009, the first shipments left its grain terminal. A small container terminal opened in 2012. What is now called the Giurgiulesti International Free Port can receive seagoing vessels, and since Russia banned imports of most Moldovan food products last year, the port has played an increasingly important role as a way to access new markets for Moldova. 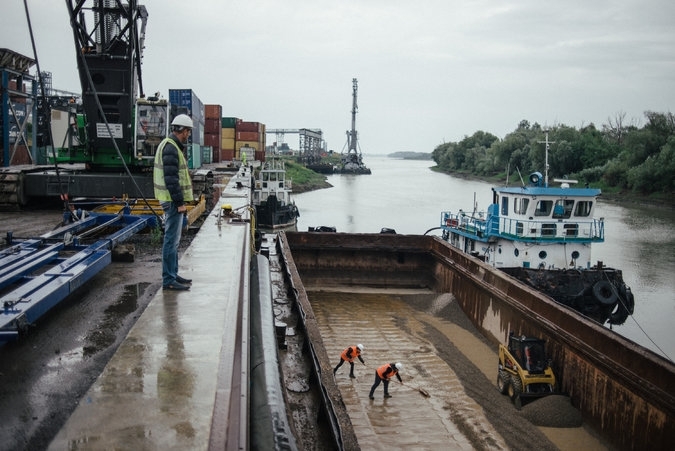 Last year, the port increased its shipping volume by more than 65 percent, said Thomas Moser, a German businessman and the general director of Danube Logistics, the company that operates the port. Certainly, the port has been a lifeline for the farming village of Giurgiulesti, less than half a mile away. The village is a three-hour drive south of the capital, Chisinau, and much of that journey is along pocked roads. Until the port came along, there were few reasons to visit.